Enrollware delivers best-in-class course registration solutions for training centers, training sites and instructors. Our easy-to-use, web-enabled automation for class management, rosters, card printing, payment processing, and administration solutions allows our clients to grow profits, reduce costs and better serve their customers. Enrollware Class Registration Reviews Recently Reviewed! Enrollware...Gets your training center MOVING! Pros: I truly enjoy the ease of use, and that makes training other associates very easy, as the learning curve is very flat. There are so many intuitive features that you would probably not need to visit their help pages, although they are so well done that I visit them all the time for new ideas. The software takes out the drudgery of accounting, rescheduling, and class notifications and puts it into an automated setting. It eliminates the need for the "shopping cart," and instead makes it so much easier to handle the general public. There are so many ways to make the software "your own" with all the options to customize the consumer choices. You can add options, create promo codes for discounts, and track clients efficiently. I really like the fact that I do not have to spend time tracking down information from disjointed sources. Everything I need regarding registration, payment, reporting, and even issuing completion cards is located in one system. The export-ability of student information is incredible, as well as the ability to remind students of expiring cards, and other issues such as parking restrictions at select locations. It is FANTASTIC to have such command at your internet-connected computer (or phone, as it is mobile-friendly) to manage your business with minimal hassle. Cons: There are very few cons, if you set your system up to do what you want it to do. There are many approaches toward setup and usage, but in the past 5 years, I have not encountered any setbacks. Support services are extremely responsive and are willing to accommodate requests if the need arises to facilitate additional functionality to the system. Overall: I have solved accounting, registration, keycode assignment, reminders, and remarketing issues with this software. It has eliminated the need for spreadsheets, shopping carts, and CRM software as a result. Pros: Enrollware is a great software that has performed very well for our business. It is worth every penny, the headache it will save you is absolutely priceless. The best feature of the software is that you don't have to be a rocket scientist to use the software to it's capacity. Enrollware does pretty phenomenal stuff, but it does it without you having to read a phone book size support manual. Support is awesome, they are there to answer questions and help you solve the problems your segment of the training industry faces, when classroom product vendors can not be reached. Cons: Enrollware does not have any features one can find not likable. I know some can sit there and think of millions of things you can add to the software (not understanding the training industry) and hope that the software can wash your car too. But the geniuses that created the Enrollware are sharp as a tack and understand the actual purpose of the software. Think about it, does amazon or google really need more buttons and things added to them to do the thing they do way better than their competitors? Functionality is what you get with enrollware, not bunch of features that will look good to the inexperienced buyer. If you are in training business for real and you really want to put in the effort it takes to train thousands, you should go with Enrollware. Overall: We are in the industry of compliance training, where the class participants need to get into classes in a timely manner. Enrollware is very streamlined to get this done for us through our online signup portal. Also we are able to sign folks up from the in coming calls through our call centers. Internal processes in our back office flow very well due to ease in transferring students to different rosters, handling reschedules etc. Rather than focusing on piles of of documentation each class generates, Enrollware lets us focus on the quality of the classroom instruction we provide. Pros: Everything. I met support team member at a conference years ago - we were booth neighbors. 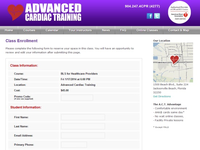 We had recently become an AHA Training Center and after seeing a demo of the Enrollware software I gave him a credit card right then and there. The ease of use has made the cost of managing our TC drastically decrease. The ability to log in from anywhere and pull up records has made a huge difference. The transition from paper cards to eCards was seamless with Enrollware (more-so than with AHA). We have approximately 30 active instructors that have access to the system to process rosters and even those that use it only a few times a year have been able to use the system, without problem. Cons: I believe the only downsides to the software are limitations only due to the inability for AHA to share data back into the system (i.e. eCard codes after assigned). It may be a feature coming, I know there has been an update recently allowing me to assign cards directly via Enrollware, although I have yet to use the feature (I believe I was just given the ability to do that, today). Overall: We can easily allow customers who have accounts to allow for participant registration with promotional codes - the reporting makes billing a much simpler process, saving us time and administrative fees. Managers can easily use the bulk-register feature (when given access) and students find it simple to register from the front end as well. Fantastic Software for Education Centers! Pros: We have been utilizing Enrollware in our business since June of 2014. We use it for scheduling classes, individual student registrations, bulk corporate registrations, payment processing, email confirmations and reminders, among other things. The program was easy to set up, customer support which has been fantastic and it just works. It's hard to measure, but I would guess Enrollware has made us at least 70% more efficient compared to how we did things prior to using it. It's also very helpful when we need to do a look back on a certain class or student, sure beats digging through boxes of paper! Well worth the cost, it easily pays for itself many times over, month after month. Cons: I can be quite critical of products, services and how businesses are run. Honestly, I cannot say one negative thing about Enrollware, how the software works or how they run their business. They know what they are doing and do it well. Pros: This software registration system has greatly helped my business. This streamlines the registration system for students enabling us to better manager class attendance and send reminder emails. Best of all the software designer, Steve, has made changes to site to make the system more user friendly and productive. I love this software. Cons: My only complaint is not to Enrollware but to the AHA and AHSI. I wish AHA and AHSI allow Enrollware to more fully integrate the online component of keycodes and classes into Enrollware so that we cound manage all functions from Enrollware. Overall: Enrollware has definitely improved the efficiency and productivity of my business. This site has been extremely adaptive to my individual business needs and has solved several management problems that I thought I would just have to live with. 5 GOLD STARS for Enrollware. Pros: Enrollware has been an excellent program for our training center to manage registrations and stay in touch with our students through a comprehensive registration management program. The ability to send automatic course confirmations and targeted course information to specific student populations has streamlined our workload and allowed us to focus on what we do best - provide quality training. The system has been flawless. Cons: There are no cons for us working with Enrollware. The customer support is fabulous and when we find a need, they have been super fast at helping us find a solution. Overall: With Enrollware we were able to solve issues that involved duplication of effort and inability to easily see and share student course completion. This exceeded our expectations. Pros: The program is simple to use and does not take a huge amount of time to learn as did other programs I tried. Organizing student records is a breeze. Cons: Like an Apple product, if you want to really "tweak" the program....you can not. But I see this as a positive...it keeps me from breaking the program. For example, it is not possible to really customize some pages...not a big deal... and like an Apple product...it just works! Overall: This solution makes it simple to manage classes and student records. The support is awesome. I've had a couple questions (because I'm always trying to do more with products) and the support team ALWAYS answers my questions in a timely manner! Enrollware fits like a glove! Pros: It is designed specifically for our kind of business and is VERY user-intuitive and easy to setup and use. Cons: That is doesn't have a bookkeeping function so we could dump QuickBooks. Overall: We have 5 locations using Enrollware. In each location we were actually able to reduce staff by either a full-time of part-time employee. This is because our staff no longer has to take calls for people to register for our classes. And, in this day, people really prefer doing things like this online. We probably have 90% or more of our registrations done on line now. The customers love it because they can take their time and pick and choose what they want plus the get an immediate confirmation document and invoice. Pros: Very user friendly. The company customized some of the features making it perfect for our use. Cons: I can't think of anything I haven't liked or found problems with. Overall: Excellent prompt response to questions when I was first setting it up. I've never had any glitches to deal with. I would highly recommend this product. We are an association who educates about 10,000 students a year. This software tracks everything and makes registration simple. Pros: Easy to use. The developers clearly took the time to understand the business requirements of training organizations. Cons: I wish it was recognized as a learning management system. Overall: Easy to setup, very customizable, support team is easy to work with and is very accessible. Pros: Has great reports. Easy to export to excel. 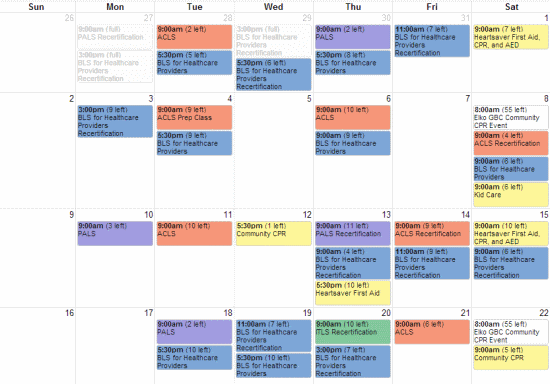 Cons: Cannot see class list in calendar view for scheduling classes. 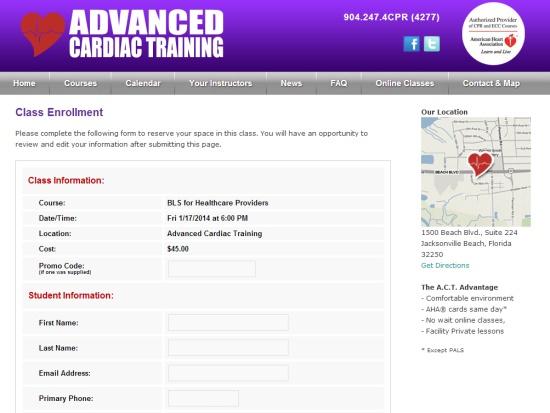 Overall: Working as a CPR instructor and bookkeeper using enrollware made everything easier. All your classes in one convenient location. Pros: I can very easily see all the classes I will be teaching in one place. 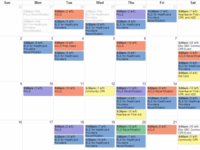 This allows me to plan accordingly and prepare for the class size. I can also view the students and see who has and has not paid for the classes. 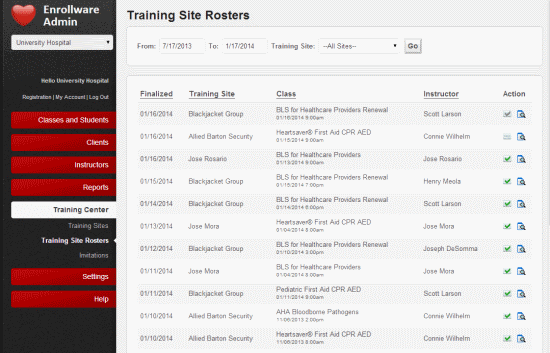 It can be filtered to only include particular instructors or you can easily view all classes and instructors. Editing student information is simple and easy. Checking in students is a breeze. Cons: Depending on your internet speeds, the site can be a little unresponsive at times. Generally not a huge deal unless you are dealing with a large number of students or payments. Overall: Overall, my experience has been very positive with Enrollware. Being able to accurately track student registration and plan accordingly is a great help to preparing for any class. Pros: Since we use Enrollware in my small business everything is easier to organize, the features of this application are quite useful. Cons: I have no complaints so far since I use this software, it is very good and complete, I will recommend it to my friends. Overall: Keeps the staff organized with the group record. We love. Pros: Systematization of classes, schedules, payments which allows a better organization of time and investment. Cons: In a functional way I have no complaints, it would only improve the colors and design a bit so that it is more aradable in sight. Comments: As a small business owner, I'm always looking for ways to make things more efficient. Enrollware has made our student registration and course management pieces nearly fully automated. Our team loves the functionality and ease of use. Great solution in Enrollware! Pros: Saves time and will free you from tedious activities. Enrollware does everything that it claims. Bob really takes an interest in his clients. Overall: Once you try Enrollware, you'll love it!